The reveal period for Rise of Shadows kicks off with the customary reveal stream. Peter Whalen was joined by Chris Sierra and Cora "Songbird" Georgiou and they revealed a total of 12 cards. We also got an interesting tidbit of information as callbacks and Lackeys will be limited to the E.V.I.L classes, while the Twinspell Keyword will be available only to the Defenders of Dalaran. With Dr. Boom as his Legendary minion, Warrior is all about mechs and more importantly bombs! Rogue's leader is King Togwaggle who brings back Treasures. 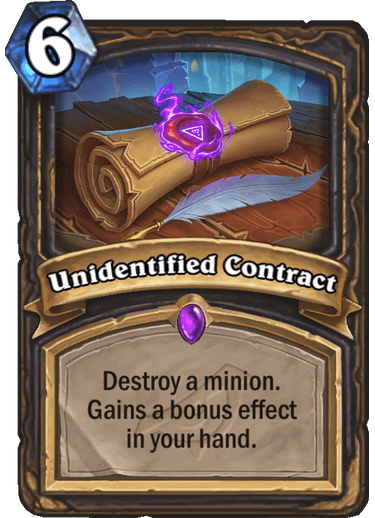 Rogue has another callback mechanic: Unidentified! Two potential Contracts were revealed; there are four in total. 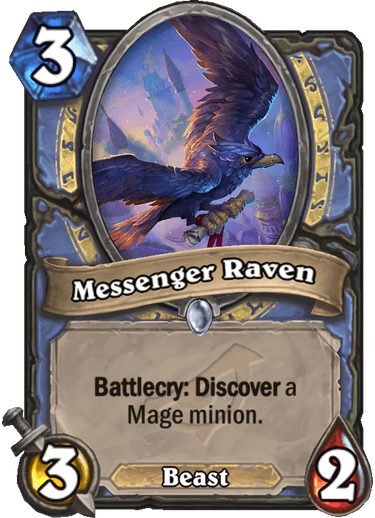 Mage is all about minions again. Maybe it will work this time! The final reveal stream will take place on April 3rd and it will be presented by Dean "Iksar" Ayala, Brian Kibler and Chris Sierra. You can check out the schedule for the upcoming community reveals here. Card images are a courtesy of u/xcrouton. Other two versions of contract says either summon a Patient Assasin, or add two coins to your hand. This was one of the worst reveal streams I've seen. Cora roped every single turn, paladin deck had nothing new in it, even neutrals, guy sitting right of Cora was silent the entire stream. Cards don't look bad, but Boom's Scheme is a weak card, probably the worst scheme revealed so far. I like the Rogue legendary though. Boom's scheme is rather bad. Compare it to Shield Block, costs 1 less mana, gives you 5 armor instantly, and draws a card. Dr. Boom's Scheme needs to sit in your hand for 5 turns just to be equal in armor and still be an inferior spell. 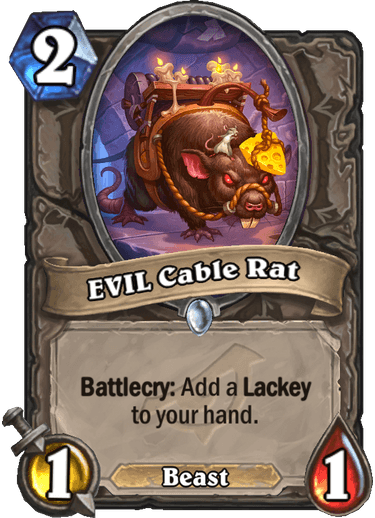 Unless it's in your opening hand and saves you after a long game of control, it seems worthless, it's especially ugly if you draw it in the lategame with few turns left. I know now that I'll make a bomb warrior at day one and that it'll never work. While the cards revealed so far were nice but not extraordinary, I think we have a few blockbusters this time. 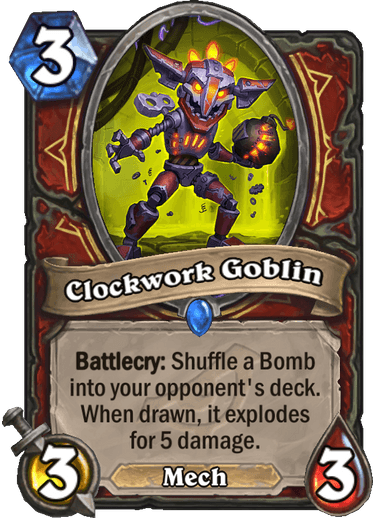 Clockwork Goblin and Wrenchcalibur set the base for a bomb-based warrior deck. 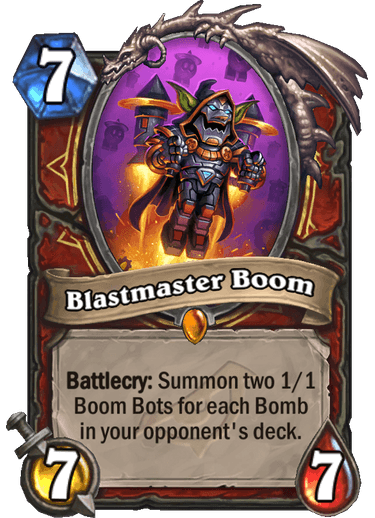 The existence of Blastmaster Boom suggests that there will be a couple more cards generating bombs, in addition to the already available Seaforium Bomber. 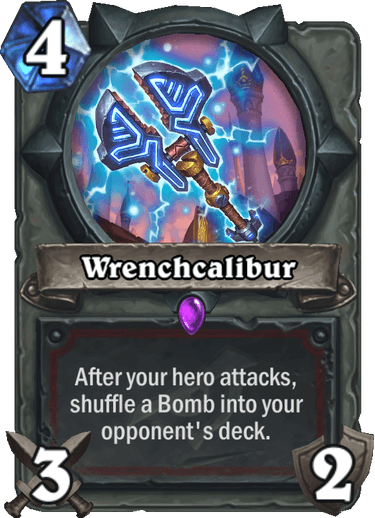 And we have cards to generate more bombs (Omega Assembly for Clockwork Goblin, Captain Greenskin for Wrenchcalibur, Augmented Elekk for all 3). If just one more of the same is coming, this could be a viable deck, possibly quite strong, and certainly fun to play. Hakkar, the Soulflayer could complement the deck nicely, even if it does not generate formal bombs, the concept is pretty much the same. 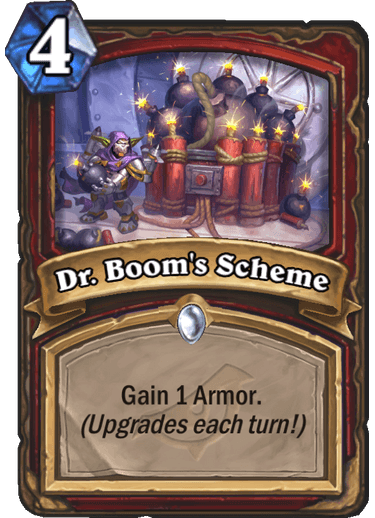 I will agree that Dr. Boom's Scheme looks weak, however if a bomb-based deck sees play, it will require huge amounts of armor to be able to wait until the bombs kill the opponent, especially if Hakkar, the Soulflayer is also included. So I won't swear that this scheme won't be played. Remember that many armor-generating cards will be cycling out, such as Iron Hide, Drywhisker Armorer, Bring It On!, Mountainfire Armor, Unidentified Shield, Plated Beetle and Gluttonous Ooze. 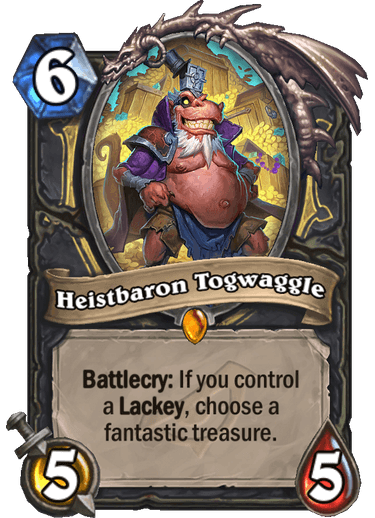 If the treasures generated by Heistbaron Togwaggle are the same as the ones from the Master Chest, then it is an insanely strong card, a much improved version of Marin the Fox. Not only is it faster to play, with a better body for the cost, and you get the treasure immediately, but on top of that you get to choose your treasure. And the condition to enable the battlecry does not look difficult to fulfill. 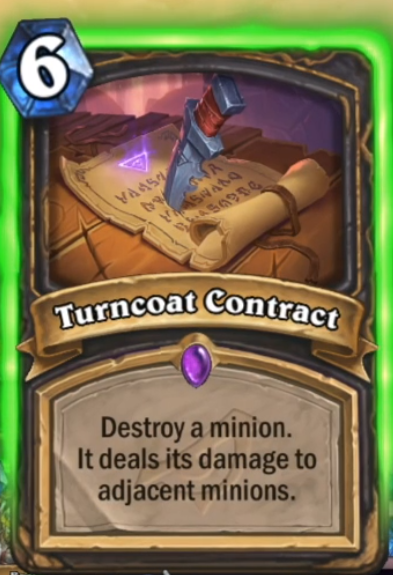 This will be an auto-include in any Rogue deck with Lackeys, and an incentive to use Lackeys. 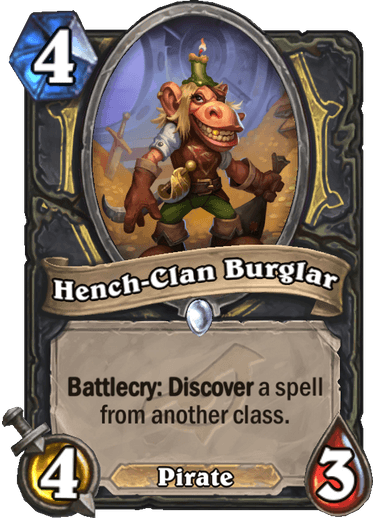 I'm happy to see the Unidentified mechanic coming back, as this was my bet for Rogue's callback a few days ago 😀 Only surprised that there are in fact 2 callbacks for Rogue, while I expected exactly one per class. Unidentified Contract is a bit expensive, but 3 out of the 4 options are really good, so worth the price in my opinion. Turncoat Contract is awesome. A much stronger Meteor (because it is irrelevant if the target has divine shield and there is a high potential to inflict much more damage to the neighbor-minions then 3. Hrm, what I saw of Hand-Mage aka Minion-Mage was quite good. Not Tier 1 but definitly playable. 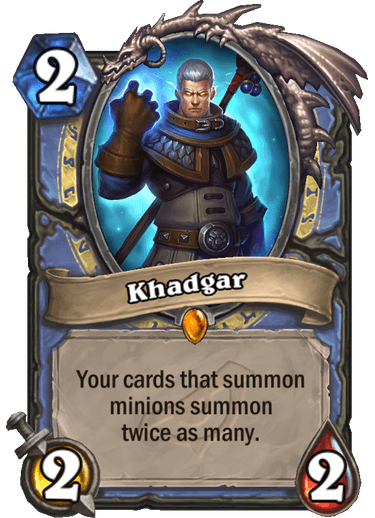 And with a powerful card like Khadgar (who I did not expect to become a 2 man 2/2) even more. 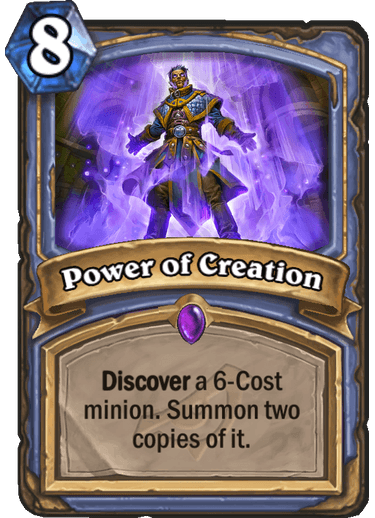 Power of Creation seems alright also. Paying 8 Mana for two 6-Mana minions seems like a good equation (and getting four for 10 mana with Khadgar might be doable too). Also the pool of 6-mana cards is incredible strong (for now) - Cairne Bloodhoof, Damaged Stegotron, Argent Commander, Reckless Rocketeer...wait...this is scary! I also like the Bomb-Idea for Warriors. Sitting back and tank was already a common strategy for Warrior but now with some explosives in your opponents deck you hopefully don't have to wait for them to surrender or die from fatigue. To me it seems way more fitting for a warrior to do something like this than to rush your opponent down with pirates. Also "Blastmaster Boom" seems already very powerful with only a single bomb in your opponents deck...so I am pretty sure this kind of deck will work (and might become pretty annoying to deal with).
. Also "Blastmaster Boom" seems already very powerful with only a single bomb in your opponents deck...so I am pretty sure this kind of deck will work (and might become pretty annoying to deal with). 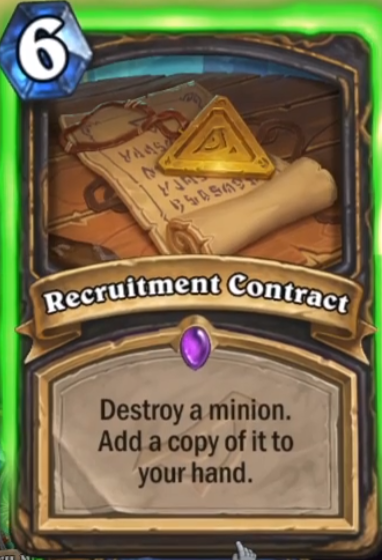 I guess this card will see quite a lot of play. The problem with the bomb thing for Warrior that I see is it's too damned RNG, and is a bad matchup against some decks. Anything aggro will likely run over a "bomb" deck, a bomb deck by nature is trying to stall while playing utility spells with no immediate payoff, and unless we get a new way to get 4 armor via hero power, it's hard for warriors to do with with only brawl and a few other tools. Remember we're losing a lot of good stall taunts and tech (Baku primarily but there are others). 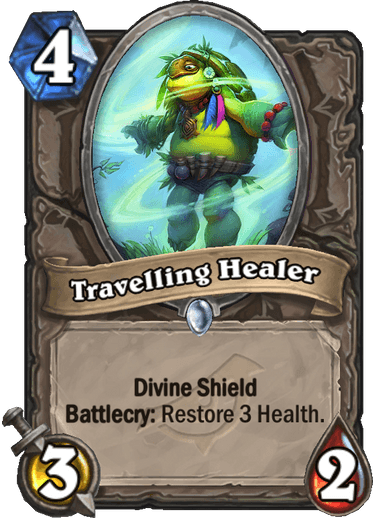 Decks with good healing are also an issue, and there's plenty of ways to mitigate "Just" 5 damage happening at random. Dr Unbalanced might still be stronk but he needs help to win a game. Finally, simple RNG might laugh at you pretty easily. Bombs are not a reliable damage to happen when you want it to happen, IE they can stick to the bottom of the opponent's deck, or be drawn before you can play Dr. Boom, etc. The ideal situation is to play some of them in a fatigue scenario to speed up your opponent's clock. Problem with armor source still stands though.